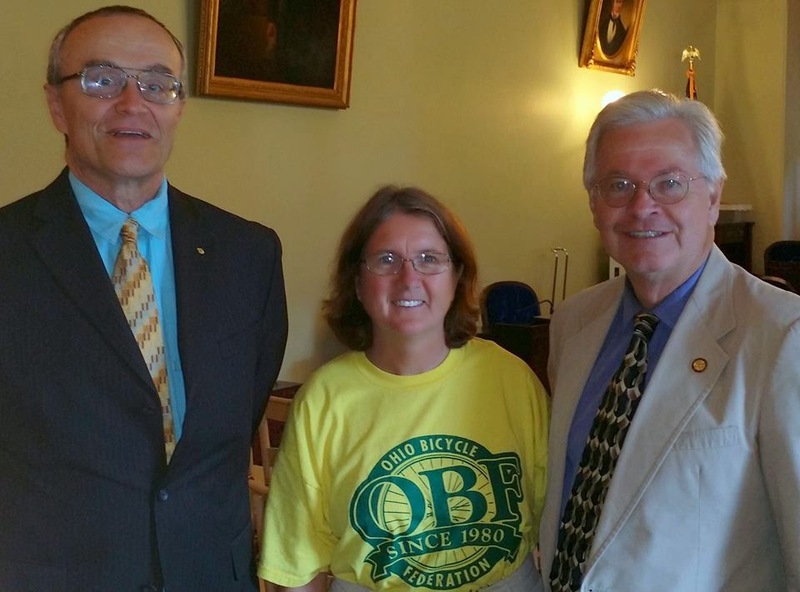 In the photo above, taken yesterday (May 27, 2014), Chuck Smith and Tricia Kovacs of the Ohio Bicycle Federation are joined by State Representative Rex Damschroder, who is also Chairman of the House Transportation Committee. They are in the Taft Room of the state house celebrating the passage, by a 7-2 vote, of HB145 by the Ohio House Transportation Committee. HB145 includes the state-wide 3-foot passing law, plus a provision that allows cyclists to legally proceed through a traffic signal when the sensor fails to detect them. The bill goes next to the Speaker of the House and the Rules Committee before a full vote in the House. The full vote may come as soon as next Tuesday, June 3!